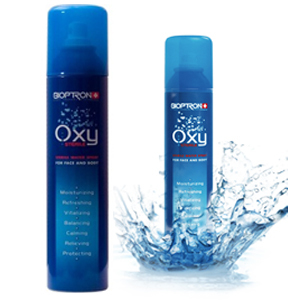 Oxy Sterile (250ml) is pure water enriched with a high concentration of pure oxygen for moisturizing, refreshing, vitalizing, balancing, calming, relieving and protecting. SKU: oxyspray. Category: Bioptron Accessories. Help your skin to fight environment pollution. Oxy Sterile Spray can be used every day and whenever you wish to freshen up, in every season and in every weather. On its own Oxy Sterile Spray can be used whenever you want to refresh and vitalize the skin. Combines with the other cosmetic products it can be used to complete the facial cleansing and as a finishing touch to the daily skin care. Subtlest dispersion of the spray also allows the use over make up for fixation. Oxy Sterile Spray is suitable not only for the face but for the entire body. Simply spray a thin layer Oxy Sterile Spray on the skin. Do not wipe or pat dry, but let it dry by itself. Oxy Sterile Spray is a natural and unique skin care product formulated to provide our human skin with hydration and vitality. Our skin needs oxygen and water to stay healthy. In the process of ageing our skin vitality depends increasingly on sufficient supply of oxygen and water. A lack of oxygen can result in a change of the skin’s metabolism causing the skin respiration to slow down, what finally can cause premature skin ageing. Oxy Sterile Spray can help your skin to look healthier and more beautiful. It is available in 250ml size and 125ml size.